The last journal number of 2018 consist of fourteen scientific articles. The editorial board are proud to announce that the geographical scope of researchers is growing. Published articles has been prepared by scientists not only from Baltic countries: Lithuania, Latvia, Estonia and Poland, but also Eastern Europe and Central Asia: Ukraine, China, Malaysia as well as Central Europe: Italy and Germany, United States. 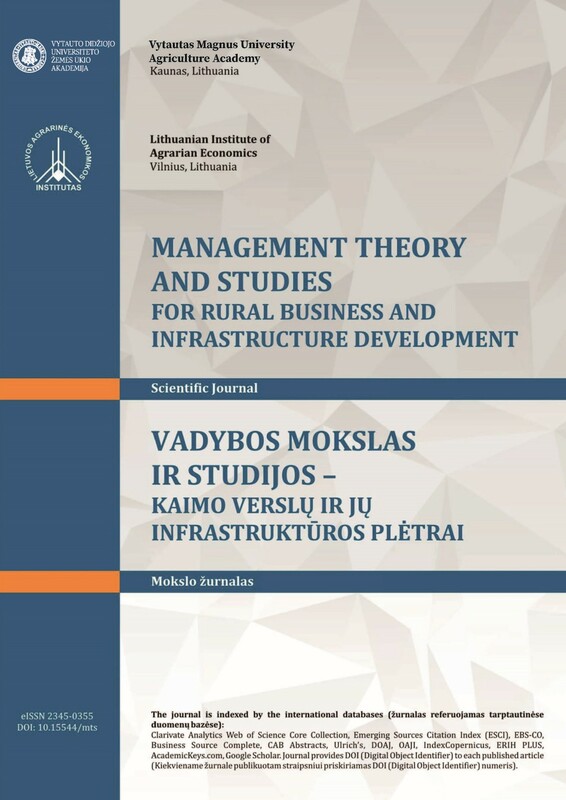 In this journal number are published a highly important research results related to such topics as bioeconomy development potential from the perspective of innovation economics in European regions; presented the world trends of organic production and consumption; presented model for ensuring the economic security in the agrarian sector, analyzed the concept of research on Logistics management and public networks as well as other research topics. This regular journal number consists of twelve scientific articles, which has been prepared by scientists from Lithuania, Italy, Poland, Ukraine, China and other countries. Presented research topics are very broad and include today's scientific discussions and practical issues. It has been published the researches related to environmental management issues and its social – economic monitoring, global innovation ecosystem modeling, rural communities settlements as a self-government models, gastronomic cultural heritage, clustering international agricultural trades and other actual research results. The scientific publications are significant due to new theoretical scientific insights and the practical application of research results. 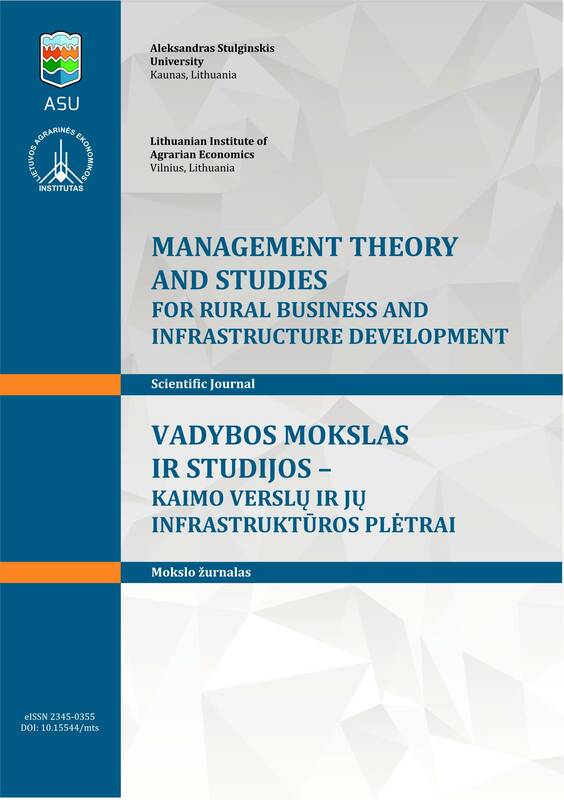 The edition of this scientific journal consists of fifteen scientific articles, which has been prepared by researchers’ groups from Lithuania, Poland, United Kingdom, Japan, Russia, Jordan, Ukraine, Latvia and other countries. 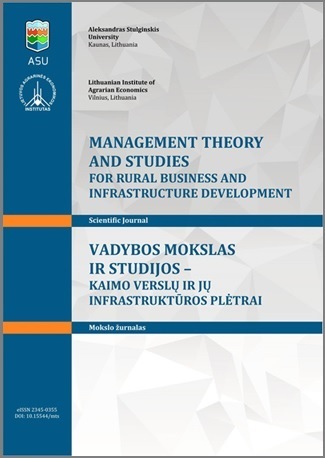 In this regular journal number, has been published the research which explains the role of rural development management administrators in realization process, has been presented factors that is affecting European innovation partnership, the methodology of the creation and evaluation of logistic services value; modeling of the prospects for sustainable development of agricultural territories in the pilot networks and other important research findings.